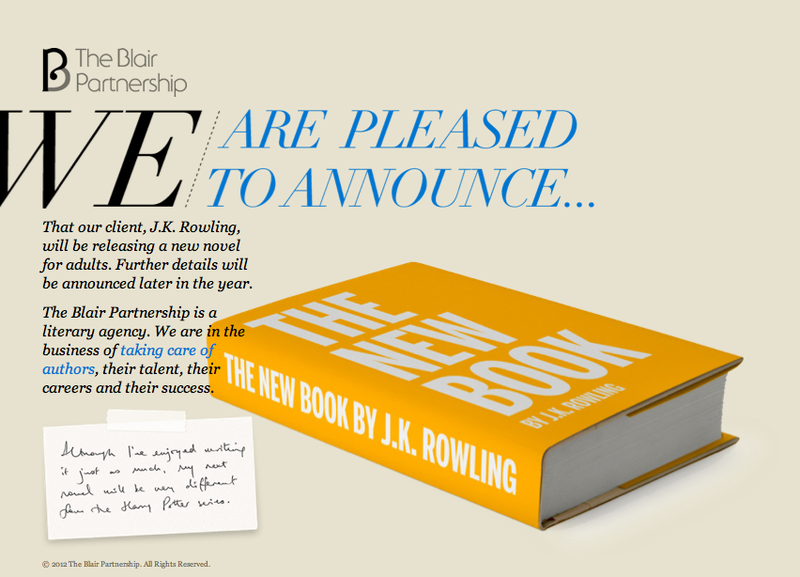 I’ve seen a lot of people complaining that there’s so little information being released about the new J.K. Rowling book. I’ve also seen a lot of people just discussing what they think it might be. Mostly, it seems it’s all excitement and fun. In an article speculating about the novel (and it seems the article was written in good humor), Entertainment Weekly stated that Rowling’s agent’s website has a “picture of the book’s ‘cover'” that is “intellectually insulting”. Of course, curiosity got the best of me and I had to peek. Please note: This is a screen shot of theblairpartnership.com as of 3/3/12. The website and images are owned by theblairpartnership.com, NOT LITERARY OBSESSION.